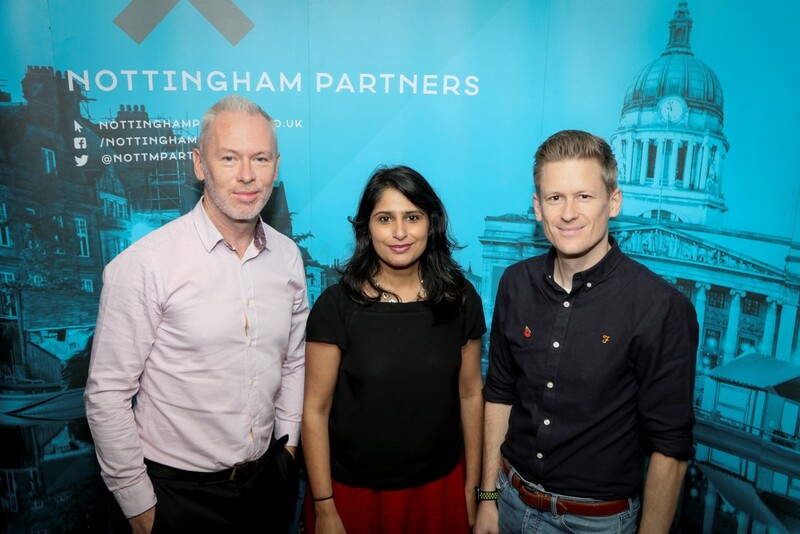 Over 90 guests from leading city businesses attended the latest Nottingham Partners event at Alea Casino in Nottingham on Friday 9th November to hear talks from Sandy Mahal (the Director of UNESCO City of Literature), and Olly Betts (CEO and co-founder of OpenWrks). The lunch began with networking amongst the attendees, providing an opportunity for members of Nottingham Partners to socialise with acquaintances and make new connections with like-minded businesspeople, sharing their business updates and ideas before tucking into a lunch provided by Alea. The talks were kicked off by Brendan Moffett, Chief Executive of Marketing NG, who warmly welcomed new members V21 Productions and Buckles Solicitors before updating attendees with some of the major city news, including the planning proposals for major office development at Unity Square, regeneration works at Nottingham castle now being on site and the creation of a new city centre strategy group to future-proof Nottingham city centre. He then invited the first speaker, Sandy Mahal, to the stage, introducing her as a “fantastic ambassador” for the city as she represents us as part of the UNESCO creative cities group. Sandy began her talk by speaking about the importance of stories and storytelling, describing it as a “huge part of what makes us human”. 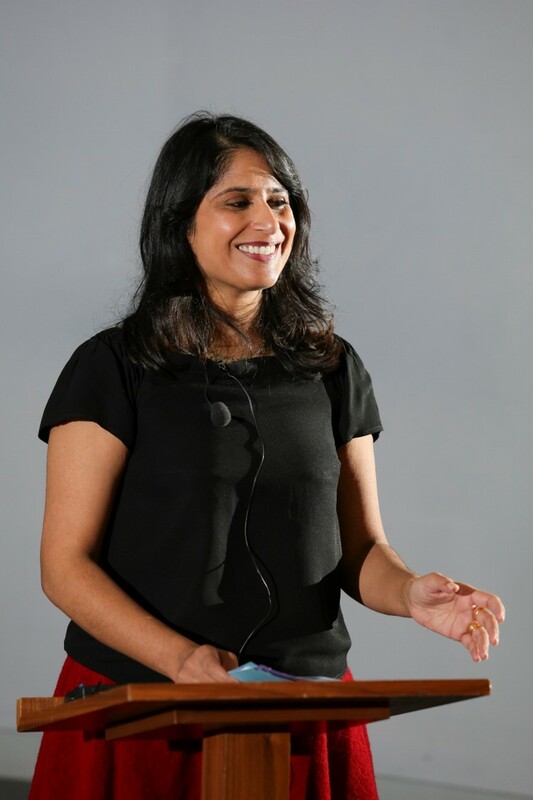 She shared the powerful role that literacy has played in her life, telling intrigued listeners about her challenging upbringing, which was shaped by illiteracy amongst her family members and her young marriage. Her life was transformed when she attended university and “fell deeply in love with libraries”. This led to a “strange dual life”, in which she was simultaneously part of the Punjabi community “insulated by language, ritual and superstition” and also the library community, which cultivated her “deep relationship with reading”. Sandy invited the audience to tell her about books that had shaped their childhood, eliciting an interesting variety of responses, before recalling how the lack of working class writers and writers of colour 10 years ago had left her struggling to see books that reflected her own experiences. Today, she told us, they have collectives of northern working class writers, called Common People, and are working hard to get more people of colour into print alongside the likes of celebrities such as Stormzy, which is reflective of a wider focus on diversity. “The push for a more diverse and inclusive workforce is not just a current trend, but a new reality,” she said. She explained how literacy skills are critical for success; the earlier children develop writing and reading skills, the better their chances are later in life. She calls this “the fundamental building block for social mobility”. 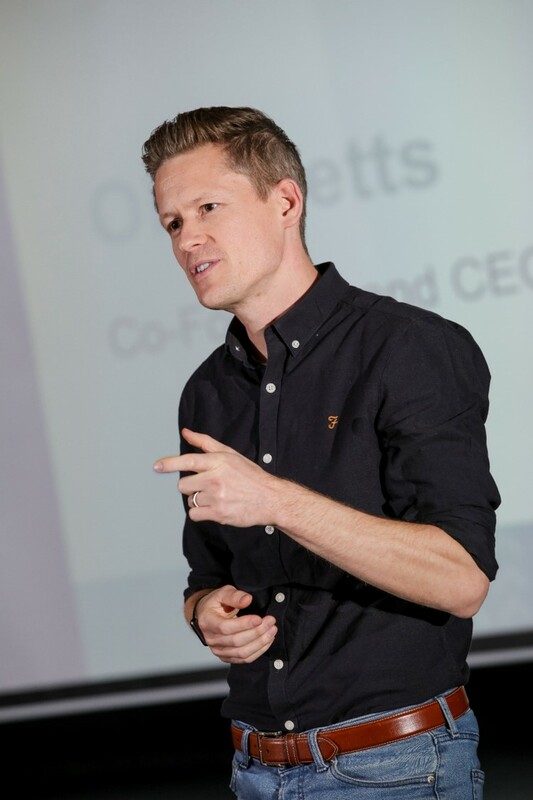 The next speaker was Olly Betts, co-founder and CEO of OpenWrks, who began his talk by explaining his background and history, sharing what he had learnt on his journey and how it had shaped him as a businessperson today. Whilst at university, he discovered a passion for problem-solving, and subsequently started a career at British aerospace. He explains how he was asked to re-engineer their production line to improve efficiency, but knew that his solution would mean the loss of jobs. He explains that this experience taught him much about navigating working relationships and different perspectives. Olly began to realise that he desired a job where he felt he had made a tangible, positive impact, and decided to change career. He saw a recruitment advert for Capital One (laughing as he recalled how the advert simply described Nottingham as ‘really cool’) and decided to apply. With no prior experience in the financial services sector, he contacted an acquaintance who already worked for the company to ask for tips. The friend, however, said he was leaving for a debt sales company, TDX, so Olly joined him there instead. He learnt about negotiation and the importance of data and information, whilst further developing his problem-solving abilities. He then started reading a lot about open banking and founded an open banking company. They support people who are new to the country who may “struggle to do things we take for granted”, such as renting a property or providing evidence of employment. They can also reduce the stress of being in debt by providing financial advice. Olly explained that their technology is “massively sophisticated and advanced” and that they are “growing fast as a business”. He then shared some insights on how to build a business in Nottingham, highlighting the importance of having a growth mindset and remaining open to learning new things and improving. His business uses the latest technology and offers flexible working in a bid to be appealing to talent, and specifically looks to hire people who share the growth mindset with the company. The next event is the Christmas drinks reception at Alto Nottingham on Wednesday 5th December 2018, 5-7pm. The event is free to attend for Nottingham Partners but places must be booked in advance. We have a great calendar of events lined up for 2019, including our inaugural Dinner and as such there has never been a better time to find out more about Nottingham’s premier network. Contact Annette Thornley, our Commercial Partnerships Manager for more information at annette.thornley@nottinghampartners.co.uk or 0115 962 8311.